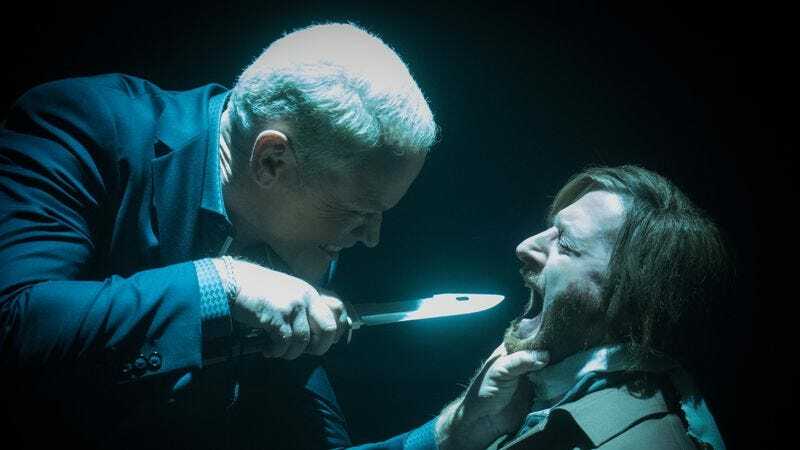 At the end of my review of last week’s DC’s Legends Of Tomorrow, I wrote about how the Legion of Doom needs some sort of firm motivation if it’s going to make a compelling Big Bad for this season. That’s exactly what the show delivers tonight with an episode appropriately titled “The Legion Of Doom,” exploring why these three men have joined forces and putting them on equal ground to cause lots of mayhem for our heroes in the future (and the past/present). The episode opens with a new introduction courtesy of Damien Darhk, establishing that this chapter will be devoting most of its time to developing the villainous trio, and the title card reinforces that by throwing down the logos of the Legion’s members rather than those of the Legends. “The Legion Of Doom” opens with a flashback to a despondent Malcolm Merlyn watching Damien Darhk’s death on TV, a scene that concisely sets up both of their motivations for joining Eobard Thawne. Malcolm wants to change his past to avoid his sorry present state, while Darhk wants to ensure that he doesn’t meet his end at the hands of Oliver Queen. Unfortunately, both of these men are basically functioning as henchmen to their speedster boss, and their egos won’t allow that. They’re tasked with getting information about the Spear of Destiny from a still mind-wiped Rip Hunter while Thawne is off running around for some mysterious reason, and eventually they get tired to working for someone else and decide to become their own masters. After torturing Rip and retrieving a tooth containing the account info for a security box in a Swiss bank, Merlyn and Darhk try to retrieve the security box by going to the year 2025 and using Rip to get into the vault. This doesn’t work because Rip doesn’t remember the access code, and they make a run for it after a quick skirmish with security. Tensions run high between Merlyn and Darhk, and they decide to settle things between them League of Assassins-style, engaging in a knife-fight that ends with them literally at each other’s throats. Rip lets them know that this is exactly what Thawne wants because it keeps them from questioning his leadership, so Merlyn and Darhk decide to team up to level the playing field with Thawne. Merlyn and Darhk trap Thawne in the bank vault to figure out why he’s being so cagey, and that’s when things get really fun. The logistics of this show fall apart if you think about them too hard, but writers Phil Klemmer and Marc Guggenheim wisely choose not to linger on explanations for all the far-fetched superhero time travel nonsense. Eobard Thawne was wiped from the timestream because his ancestor, Eddie, killed himself, but because Eobard is a part of the speed force, he was able to escape nonexistence. Now he has to keep running so that he’s not caught by the Black Flash, the time wraith that Zoom became at the end of The Flash season 2. It’s pure superhero fantasy, and as someone that loves this stuff in the comics, I enjoyed the hell out of the Thawne revelations and the very creepy interpretation of Black Flash. Thawne’s motivation has been the big question this season, and this episode answers it in a very effective way while establishing that there are threats bigger than the Legion of Doom. Now that all three members are on the same page, they decide to work together as equal partners, and their first course of action is restoring Rip Hunter’s memory. That is, with a few modifications. The episode ends with a now-villainous Rip shooting George Washington on December 25, 1776, setting up a trip to the Revolutionary War and getting this show back on it’s usual “stop this major historical event from going wrong” path. While the villains are figuring out how to work together as a team, the Legends are trying to activate the medallion that can guide them to the Spear Of Destiny. Rather than tackling this issue from a mystical angle, they decide to tap into their strength and look for a technological solution. Martin knows just the person that can help them, and he travels to Star City to enlist his daughter Lily, bringing her onto the Waverider despite knowing that his teammates aren’t going to have a positive reaction to this daughter he definitely didn’t have when they met him. Martin tells them not to mention to Lily that she’s a time aberration, but Mick doesn’t care and tells Lily as soon as he gets the chance, sending her relationship with her father into crisis mode. Putting most of this episode’s emotional weight on Victor Garber’s shoulders is a very good idea, and he brings a lot of sincerity to Martin’s relationship with his daughter. He has strong chemistry with Christina Brucato, and even though these characters haven’t spent much time together, you get a sense of their long history together. I especially enjoyed Martin’s conversation with Jax where he reveals that he didn’t want children with Clarissa because he was worried he would be a cold, loveless father like his own. Jax’s response to Martin’s fear is perfect, tying this show’s general conceit to something personal and meaningful: “Changing history is what we do.” Martin doesn’t have to follow in his father’s footsteps, and he restores his relationship with Lily by being open with her about his past anxiety and his present need to keep her in his life. It’s a warm, grounded storyline that balances the high-octane superhero insanity of the Legion of Doom plot, making this another satisfying Legends Of Tomorrow that shows this series is continuing to improve with every episode. Ray and Lily have some very nice chemistry, and I wouldn’t mind seeing them get paired up down the line, likely creating some tension between Ray and Martin. I like Lily, so I hope my gut instinct that she’s not going to make it through this season isn’t right. But she is still an aberration, and I feel like that is going to cause some problem. “You know what I love about torture? I’m not sure we have enough time for me to list all the reasons, but mainly because there’s ALWAYS ANOTHER GEAR TO FIND.” I like it when Neal McDonough yells.